Entertainment Magazine: Film: "All Roads Lead Home"
Producer-Director Dennis Fallon on "All Roads Lead Home"
What kinds of films do you look for when perusing the local theater’s family matinees? If you have kids between the ages of eight and twelve, then you know that your choices are usually limited. Are you looking for well-made family films that don’t rely on dazzling technical effects, trite platitudes, or fantasy violence? Films with appealing stories that take both kids and adults seriously? In late spring/early summer, keep your eye out for All Roads Lead Home. This multi-layered family film is directed and produced by Dennis Fallon (More Than Puppy Love), and the world premiere was held a few weeks ago at the Santa Barbara International Film Festival. My eight-year-old, Jared, and I were at that screening. Not only was Dennis Fallon there, but so were three of the film’s actors: Vivien Cardone (Everwood), who plays the central character, twelve-year-old Belle Lawlor; Jason London (Dazed and Confused), who portrays Belle’s father Cody; and Shannon Knopke, whose role as Belle’s mother and Cody’s wife Andrea is small but important. It’s what happens to Andrea and the ensuing reactions of her loved ones that sets the plot in motion. All Roads Lead Home is a film that both Jared and I enjoyed. It’s not the typical, predictable plot of some family films nor is it a family comedy. It’s about learning to live again after a family tragedy, growing up, and the importance of animals in our emotional lives. We sat down with Dennis Fallon in "All Roads Lead Home" and talked about the film. Three years ago he decided he wanted to do movies on a “grander scale” than The Movie Channel, Lifetime, and Showtime work he had done. He initially began developing a “huge animated project,” Chilly Won Ton Willy, with writer Doug Delaney. 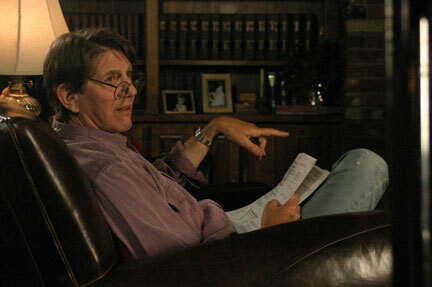 But then Dennis, executive producer Charles W. Nelson, and Delaney worked through several story ideas before Delaney gave them a final treatment for All Roads Lead Home. At that point, they asked Delaney to write the script. This is his first produced screenplay even though he has written other scripts for studios and is a produced playwright and fiction writer. So how did Dennis Fallon end up directing All Roads Lead Home? In some cases, Dennis knew he wanted certain actors for certain roles: Vivien Cardone as Belle, Peter Coyote (Erin Brockovich) as Hock, and Peter Boyle (Everybody Loves Raymond) as Poovey. 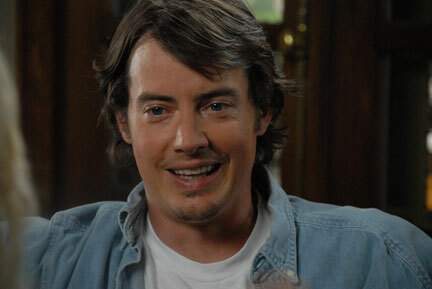 With Jason London and Vanessa Branch (who plays veterinarian Lillian Cole), the actors approached him, actively seeking their roles. It’s not surprising that an important supporting character is a veterinarian, for animals play key roles in this film. Dennis Fallon is concerned about the plight of animals, so the film makes a statement at that level. But he also uses animals as metaphors for his characters and their struggles. They are the connections between people as well as being relationally connected to people. This is true of Belle’s dog, horse, and puppies. Since it’s clear from the film’s synopsis that Belle’s mother’s death sets up the story, we will say that her fate is tied to her love of animals, specifically to saving a deer’s life. This scene happens fast, and it’s a bit scary since viewers are pretty sure what’s going to happen. This was especially the case for eight-year-old Jared. Dennis explained how we learn about the character and what happens even though it consists of just a few brief shots. When Belle stays for a while at her grandfather Hock’s farm, she discovers that he sees animals only in monetary terms. And she watches in horror as Hock’s foreman Basham (Evan Parke) appears to toss a burlap bag of puppies off a bridge at Hock’s orders. Since his daughter’s untimely death, Belle’s grandfather has gone down emotionally to the point where he coldly deems puppies not well-bred and thus not fit to live. This precipitates deeper anguish for Belle, who clearly identifies with the animals. She expresses that in everything she does. The apparent callousness about the puppies affected Jared, and he was relieved that not only does Hock finally heal, but Basham is revealed to be a generous, caring man. Perhaps it goes without saying that Belle’s growth is directly related to dealing with animals. Even a seemingly tangential thread about mysterious dog deaths involving the veterinarian and Cody gets woven into the climactic scenes for Belle. In those scenes, Belle’s dog Atticus uncharacteristically growls and bares his teeth at Basham when he tries to scoop some dog food. We won’t reveal the plot reasons why Atticus does this or how the ensuing scenes enable Belle to grow. But we will reveal a filmmaking trick: to get the dog to appear to snarl, a rubber band was looped around the top teeth, with the dog then trying to get the darn thing off! All Roads Lead Home is “inspired by a true story.” As Dennis revealed, it is actually inspired by more than one true story, woven together to give us this new tale. One is the story thread about the dog deaths. He guessed it was “probably ten to twenty-five dogs who died in real life from moldy dog food in Missouri.” This occurred before the nationwide crisis and recall in 2006. 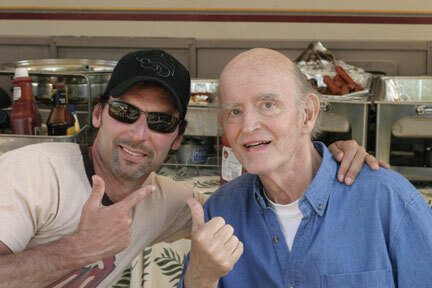 All Roads Lead Home is also noteworthy as Peter Boyle’s last film. There is always something poignant about seeing a recently deceased actor’s final performance. Boyle plays Poovey, a lonely innkeeper of an old roadside motel, where he and the motel end up with a new lease on life by the end of the movie  once again tied to everyone’s love of animals. 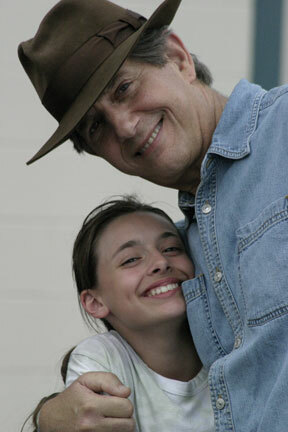 At the 2008 International Family Film Festival, not only will All Roads Lead Home be screened, but the screenplay for Chilly Won Ton Willy is in the festival’s screenplay competition  and Dennis Fallon couldn’t be happier. 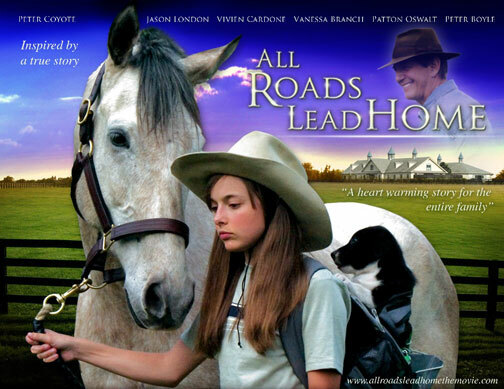 So if you’re looking for a family film that gets you thinking, allows its characters to grow, and leaves you feeling optimistic after an emotional journey, then you will want to check out All Roads Lead Home. It was released in theaters in late spring/early summer 2008. Photo 3: This is a puppy from the film. © © 2008-2016 8 Film Entertainment Magazine / EMOL.org. All rights reserved.